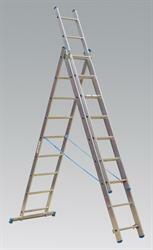 • Multi-use aluminium extension ladder manufactured to EN 131 standards. • Ideal for the tradesman, this ladder can be used as a 2-section or 3-section extension and as a single ladder, which is ideal for two-man use. • Can be used as a step and extension step ladder where stability and height are needed. • Compact size for easy handling and storage, but big enough to extend up to the apex of a house. Buying this product will earn 2520 Loyalty Points. Be the first to submit a review for the Aluminium Extension Combination Ladder 3x9 EN 131.